President Moon Jae-in and Indian Prime Minister Narendra Modi held a summit meeting in New Delhi on Tuesday, and adopted a joint declaration that outlines increased cooperation in a wide range of areas. The declaration, titled “A Vision for People, Prosperity, Peace and our Future,” is the first of its kind to be adopted by the two countries, Cheong Wa Dae said. “In the summit meeting, we shared the view that now is the right time for realizing the special strategic partnership between Korea and India, and to raise it to another level,” Moon said in the joint press conference. Moon’s New Southern Policy aims to dramatically increase trade and cooperation with South and Southeast Asian nations, while the Act East Policy pursues similar goals with South Korea and other East Asian nations. As part of the agreement, the two countries will increase exchanges at the summit level, and communication between the governments as part of their plans to work together for peace and security. The two countries will also cooperate in rapidly increasing trade, with the aim of raising trade volume to $50 billion by 2030, from the current $20 billion. In the meeting, Moon and Modi also agreed to expand bilateral cooperation in the defense industry, and to establish “Korea-India future vision strategy group” that will seek cooperation on emerging sectors such as artificial intelligence and health care, Cheong Wa Dae said. As part of the agreement, a center for collaborating in relevant fields is to be set up in New Delhi. The two leaders also agreed to expand the scope of business cooperation between the two countries to include startup companies, and Moon requested Modi’s support for Korean firms taking part in infrastructure projects. 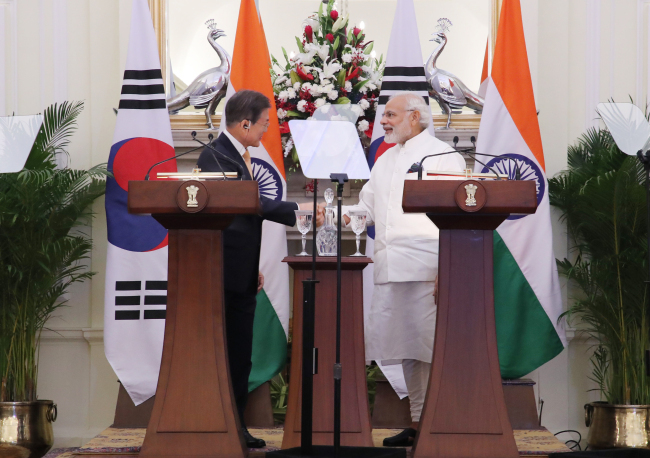 Following the summit meeting, Moon and Modi attended the Korea-India CEO Roundtable event that brought together leaders of some of the largest businesses of the two countries. Moon dedicated much of his stay in India to business and economic issues, attending a business forum and the opening ceremony of Samsung Electronics’ new plant south of New Delhi on Monday. At the business forum, Moon said that he hopes to strengthen relations with India to match those with “four major powers” -- China, Japan, Russia and the US. Moon was set to wrap up his state visit to India with a state dinner hosted by Indian President Ram Nath Kovind. From New Delhi, Moon will fly to Singapore for another state visit and return to Seoul on Friday.